Succulent fish, bathed in a coconut milk sauce and smothered with a fresh tropical fruit salsa. Soooo good! I know, more mango and coconut, two of my favorite ingredients. This tasty dish was inspired by a Bon Appetit recipe published in July 2010. I have changed the recipe significantly, using sea bass instead of mahimahi, modifying the sauce recipe using many of the suggestions Epicurious readers submitted, and finally I top the fish off with a generous portion of tropical fruit salsa. I have written the salsa as a separate recipe, because there are lots of other great uses for tropical fruit salsa. 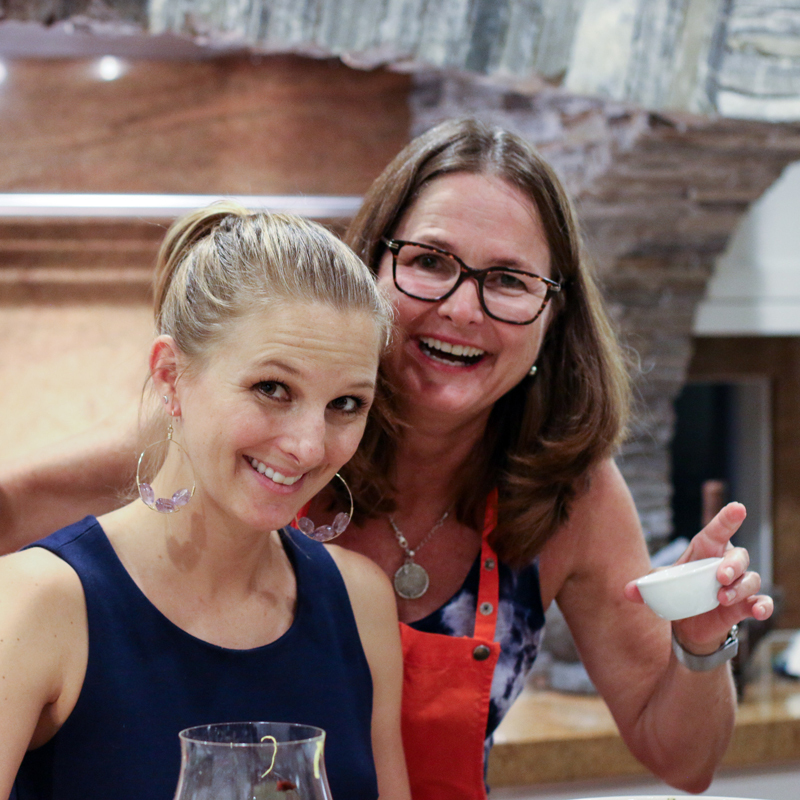 There is a long list of ingredients, but making the dish involves a few manageable steps. The sauce is not hard, it just requires a long list of ingredients. You throw them all in a pot, bring it to a boil and then let it reduce for about 20 minutes. You briefly sear the fish on the stove and then finish it in the oven. While the fish is baking and the sauce is reducing you chop the ingredients for the tropical fruit salsa. You can save time by chopping the ginger for the sauce and the salsa at the same time in a food processor or Cuisinart mini-prep. You use roughly the same amount of chopped ginger in both. See posts on how to prepare fresh ginger, and Sriracha hot chili sauce, Asian fish sauce and red curry paste before starting this recipe. Heat oven to 400 degrees. Whirl the garlic and ginger in a food processor or Cuisinart Mini-prep. Put garlic, ginger and next 7 ingredients in a pan and bring to a boil. Reduce heat to medium and continue to cook until sauce is thick, about 20 minutes. Taste and adjust seasonings. Stir in the cilantro and green onions. While sauce is reducing, sear both sides of fish in an oven-proof pan on high heat. Remove fish from stove and finish in oven. About 10 minutes, depending on thickness of fillet. Plate fish. 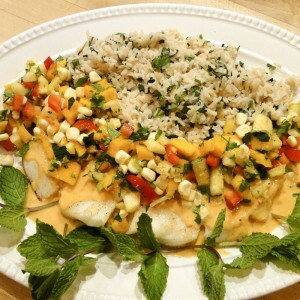 Spoon coconut sauce over fish and top with Tropical fruit salsa (See Tropical fruit salsa recipe). Loved your fish taco recipe, I am going to try this next. Glad you liked the tacos. I think you will enjoy this dish too. 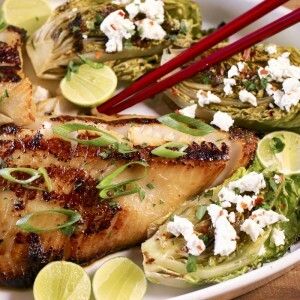 You can substitute halibut or black cod, for more sustainable fish choices. Although WholeFoods says they do have a sustainable source for Chilean sea bass. Let us know how the recipe works out for you.